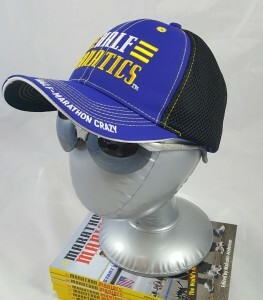 The Half Fanatic Blue Trucker Hat is made by Headsweats. This hat is 100% polyester. The black section of the hat is made of moisture-wicking material. The Headsweats Performance Trucker Hat is perfect to wear out on the town in addition to wearing while training and racing! Made from Eventure™ woven and mesh fabrics, this Trucker is a lightweight and breathable style that fits perfectly and dries quickly. The comfortable terry sweatband wrapped in Eventure knit will help keep the perspiration off of your face and out of your eyes. You’ll love wearing this hat everywhere you go!